How can you kill a tree? How many m2 4 self-sustainable? A conservatory or orangery (from the French oranger: orange tree) served to overwinter exotic plants. A (little) glass (outdoor) house is a delightful addition to the (hobby) garden. You can stretch the sowing, growing and harvesting season earlier and later (strawberry, lettuce). You can grow plants that would otherwise have little or no thrive here, such as tomato, melon, cucumber, pepper. You can overwinter here frost sensitive potted plants. I have already used the greenhouse for pitting (additional precipitation- and frost protection), or to hibernate leeks and beets so that they may be harvested easy in winter, even with heavy freezing. You may already sow early vegetables in containers. Put the plants later on not just outside, you have to harden them: gradually get them used to lower temperatures. Otherwise they may die of the cold shock (especially at night!). The most important part of the greenhouse is an old lawn chair. Sure. Blessed to sit in the spring or autumn, and even on clear winter days in the sun. Another cappuccino and a magazine there, and you get a southern summer feeling with every sunny moment. Need an excuse? Tell you should acquire vitamin D.
For the roof common window glass is a risk. Use this laminated glass or plastic sheets. 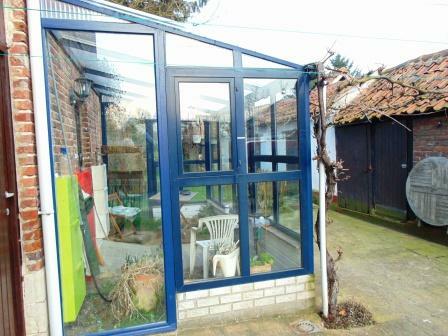 Polycarbonate is a double-walled sheet which will save up to 40% of heat according to single glass. It is lightweight and virtually unbreakable. The light is a bit less, as well as the self-cleaning capacity (raining off dirt). In the greenhouse it is hot and moist, fine for plants, but also ideal for insects and fungi. To prevent mold you need especially good ventilation. Provide hinged window(s) in the roof and / or wall. Also leave enough space between plants, and prune so that the air can freely around the bushes. Because usually the same vegetables and fruits are grown again, the ground can become quickly depleted for certain substances. And leave bacteria and fungi behind, that next year will strike again and more. So do certainly rotate crops. Replacing the soil every seven years is also a good idea. Because of the small size, and good soil with plenty of compost that you use you can cultivate the square footage intensively. A water tank in the greenhouse also works as a heat buffer. A pond also is an aesthetic heat storage tank and a blissful sitting area. The heat stored during the day is nights gradually ceded again. Watering (even outside in the garden) you do preferably in the evening (or overnight). Then it will less evaporate by the heat of the sun. I have controlled weeds in the greenhouse for several years by giving only the plants (tomatoes, peppers) water sometimes even with reversed bottomless bottles digged in to pour the water next to the plant. In the surrounding dry land then germinated much less effective weed. But: the soil drops dead. Compost dries out and perishes no longer, earthworms die. So not such a good idea. Better grow chickweed and clover as a groundcover. Do not use your conservatory in winter, give the land still regularly enough water. Otherwise it dries out completely, and very much of the soil is dead. And you just need a good, healthy and fertile soil. In the summer, the sun can burn hard. It then quickly becomes too hot in the greenhouse. Leave the windows open day and night. You can keep out the sun partially by liming the roof or to impose reed mats or by growing grapevines along the ceiling. Keep in mind for the latter option, you must prune regularly and a lot. Wash in the autumn the windows thoroughly with a little biodegradable soap. That's good against fungi, and lets in more light in the darker season. Rolling greenhouses (or tunnels) on rails or wheels are interesting to make earlier or later, successive crops and to rest the soil in the periods between. An inexpensive (partly) underground greenhouse known as a walipini: a pit or slope covered with glass. As you dig, save your upper most topsoil for the greenhouse bottom. People who live in glass houses should not throw stones (on his neighbor's roof).